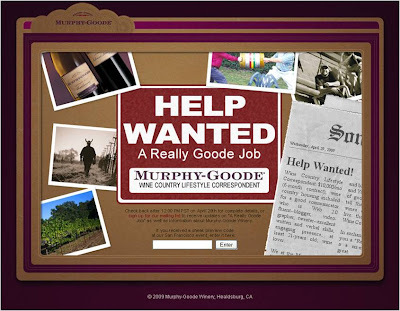 Murphy-Goode Winery in Sonoma County, California will today unveil the chance for someone to win 'A Really Goode Job' (full reveal on the Really Goode Job website at 12 PST today). Applying through the Really Goode Job website, applicants will have to upload a 60 second video application before a shortlist of 50 is drawn up and the judging process starts. Whilst this all sounds very similar to the Hamilton Island 'Best Job in The World' competition, it is a sign of how brands are starting to deploy social media. Online marketing is all about getting people to a Destination (a website, a social hub like a Fan Page or YouTube Channel etc). However, rather than rely on the traditional route of driving traffic through paid advertising, more and more brands are seeding messages into the social Conversation. If key bloggers / Twitterers highlight something it can then snowball, driving ever increasing traffic at with no additional cost. This manifests itself in a number of ways. It might be Naked People promoting a Peugeot or T-Mobile pre-promoting a Flash Mob or sheep wearing advertising placards - or it might just be a competition with a really good prize. There are no guarantees with this sort of route, (you never quite know what direction the Conversation will take), but executions like 'a Really Goode Job' definitely get people talking! I am looking for a good job.